Get your Grand Cherokee looking like it should again by replacing that broken, cracked or faulty backup light. This unit is the part of the rear lamp assembly that fits into the tailgate. Order the half that fits into the body separately. 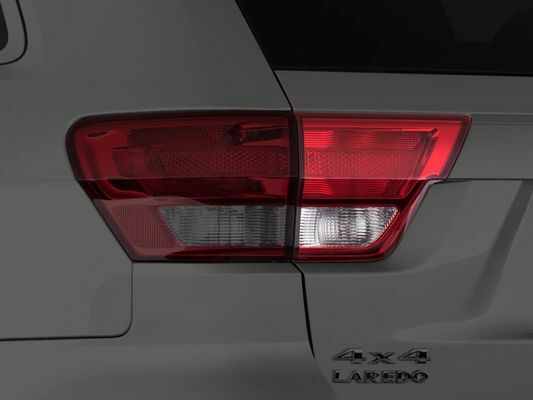 Order either the passenger side or driver's side light you need for a proper fit.? This rear lamp assembly is a genuine Mopar factory part so you know it will fit right and look like new. JustforJeeps.com helps you keep your Jeep looking good by selling genuine Mopar parts at low prices. Exactly what I needed. Arrived in perfect condition. ProsI like that this is an OEM part versus some of the others for sale out there. Fit perfect. The part fit and lined up perfectly. The included light bulbs were a welcomed plus. Part is an original in perfect condition. The fit was perfect and easy to instal. This vendor provides very good prices and excellent service. This is the only place I will guy parts for my jeep. Product is perfect....shipment was slow. I normally do not work on my jeep. I needed some advice on the installation before I bought my back up lamp. My request was answered accurately and promptly. It gave me the confidence to order the part and I was able to install it with out any problems. This came in so quick and was super easy to replace! It replaced the broken one perfectly and I was able to get my Jeep inspected! I replaced a broken lense with this. You definitely need a tool to pry off liftgate panel. I used a metal upholstery remover with no problem. Start at the top. I did not completely remove panel. I opened just enough to get my hand inside with a socket wrench. Working alone it was a little tricky. But still only took 20 minutes or so. Also, I used the existing bulbs and light sockets because they were undamaged so I did not have to unplug any wiring.